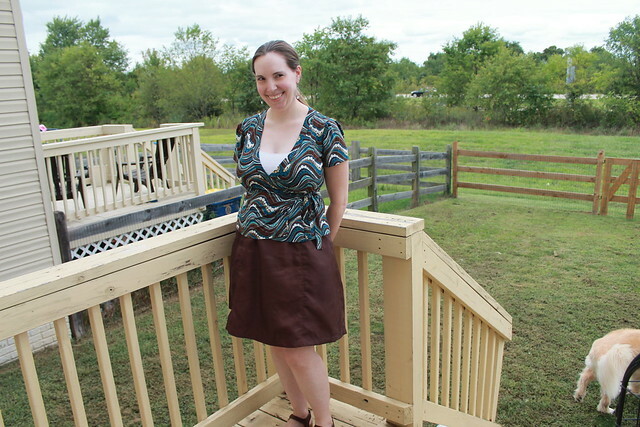 Yeah, I made two more of the Sewaholic Rae skirts, in two very different fabrics. Since I already briefly talked about the construction before, this is more to show how they ended up– and also my monthly post for Gillian’s #betterpicturesproject! This month’s assignment was to find a new spot to take photos, ideally 5 minutes or less from your house. Admittedly, the thought of setting up a tripod somewhere while lugging around Hobbit’s car seat (and quite probably listening to him scream the whole time, since the car seat is one of his least favorite things EVER so far) was not very appealing to me. So my big brave move was out to the back yard! I’ve avoided it so far, because we’re in a central townhouse, and pretty much all we ever do with the yard is mow it and let the dogs out to do their business. That, and that tan strip behind the trees just happens to be one of the busiest highways in the state. But the lighting really is better out here than in my sewing room, and Doug was kind enough to take some pictures for me. Which is much easier than running back and forth between me and the tripod. I just may have to reserve my outfit photos for weekends for awhile, that’s all. I guess I should say something about the actual sewing, right? 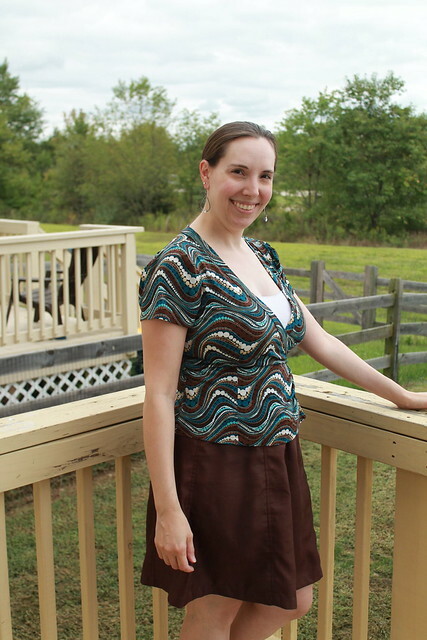 This particular skirt is half a refashion. Several years ago, I made a dress for my brother’s wedding that was a complete and utter disaster from start to finish. 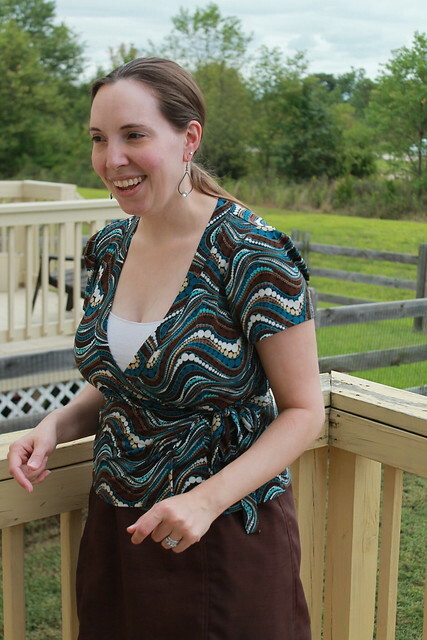 Once the wedding was over, I promptly threw the dress into my refashion bin, along with an extra yard and a half or so of the same fabric that I purchased later, with the intention of turning it into something else. I was originally thinking maybe some kind of longer, fitted, belted vest. But that never came to fruition. 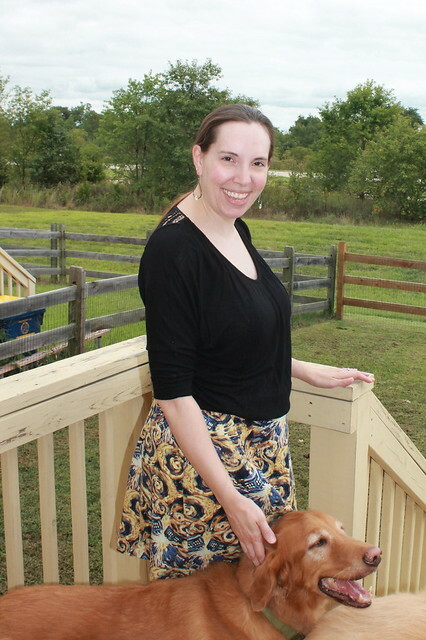 I’ve finally redeemed it with this skirt, though. The fabric itself is a polyester shantung, and I was able to cut half of the skirt out of the original dress. I didn’t have the extra piece on my original stash list, since it was out of sight in the bin and I’d honestly forgotten it was there. But I have about 2/3 yard left, so I’m estimating I used half a yard for the other half of the skirt. 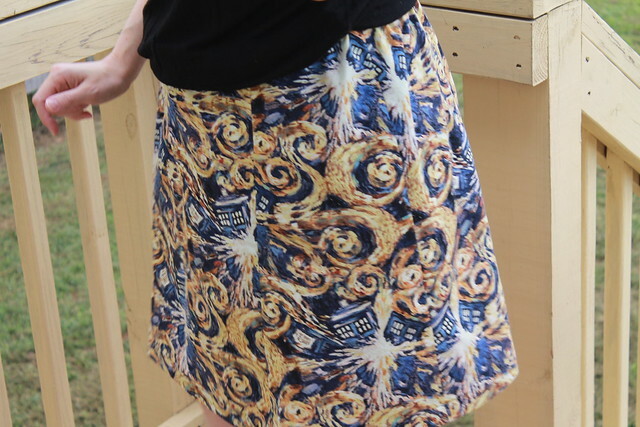 Pardon the slightly derpy face here– I’m including this one because it’s one of the best for showing the skirt detail. I had forgotten how absolutely awful this fabric frays, so I French seamed the whole thing. And since it’s polyester, of course it didn’t really press all that great, so I also ended up topstitching over all of the seams to give it more of a flat-fell look. Honestly, the effect makes me think of nylon parachutes. But since I’m coming to terms with the fact that my generally casual lifestyle doesn’t necessarily fit the shiny fabrics that I often adore, I think it’s for the best here, because it definitely helps the skirt look a lot less formal than I originally intended the dress to be. Finally, even though this is an attempt at better pictures, and I’m fully aware that the flash went off and left a weird shadow behind me, it seemed fitting to continue the tradition of golden retriever photobombing! The skirts looks great! Do you have plans to make more? Thanks, Gillian! I'm happy with how these turned out. We'll see how I feel about standing out there once it gets cold, though. I'm such a wimp about that, and I don't know how you Canadians do it! I don't have any immediate plans to sew more of these, but I could see myself revisiting the pattern in the future. They're very comfortable to wear! I haven't made that one yet! Nice to see how well it sews up! Although I usually wear solid skirts and print tops, your lovely print makes me want to reconsider! Thanks! 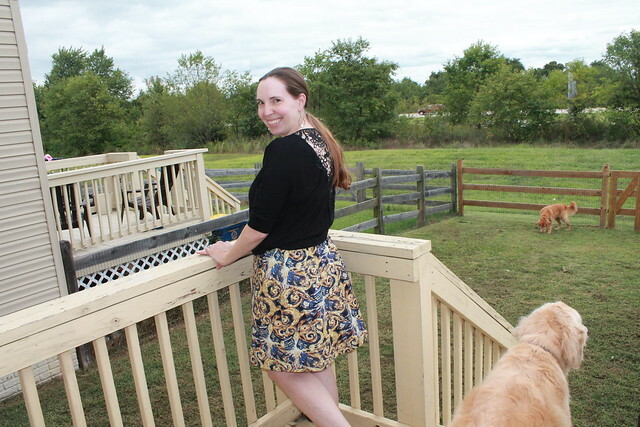 I'm a big fan of print skirts, since not every print is suited for a top and it gives me more opportunities to play!